Inside the cell nucleus, DNA is wrapped around histones (green) and tightly packaged. 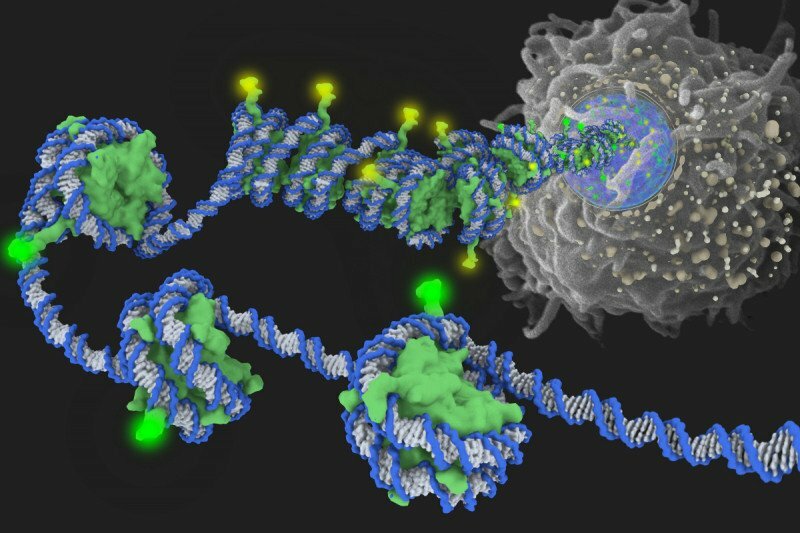 In this image, the yellow glow on protruding histone ends represents epigenetic modifications that silence genes by tightening the spool of DNA and histones. The green glow denotes modifications that relax the DNA strand and activate genes. Epigenetics — the study of biochemical changes that influence a cell’s genetic programming — is arguably one of the fastest-moving fields of cancer research. At Memorial Sloan Kettering, scientists are exploring a number of new drugs that target epigenetic processes. If such drugs prove to be safe and effective in patient trials, they might eventually offer a groundbreaking treatment tactic. Unlike most existing cancer drugs, which work by destroying cancer cells, some epigenetics-based therapies have the potential to reorient the diseased cells and set them on a path back to normal growth and development. We recently reported on one of these therapies, AG-221, which is being investigated in an early-stage clinical trial in patients with leukemia and other blood disorders. Now the promise of another experimental leukemia drug called a DOT1 inhibitor is on the rise as well. Until recently, our researchers believed the DOT1 inhibitor might be useful in only one aggressive subtype of acute myelogenous leukemia (AML), representing about 15 percent of AML cases. But a recent study shows the drug might be effective against additional AML subtypes that together account for about half of the close to 19,000 new cases of the disease diagnosed each year in the United States. The research also sheds light on epigenetic changes in blood cells that may lead to AML— and this knowledge could translate into more-powerful therapies. To learn more we talked to physician-scientist Scott Armstrong, who led the study, published in the journal Cancer Cell late last year, and is the head of MSK’s newly launched Center for Epigenetics Research. Epigenetics literally means “beyond DNA.” The term refers to the fact that all the cells in our bodies — brain cells, liver cells, and so on — have the exact same DNA, but each cell type uses its DNA differently by turning on different sets of genes at different times. This programming is determined by the way a cell’s DNA is spatially organized. Inside the nucleus of a cell, DNA strands are wrapped around spool-shaped aggregates of proteins called histones. This packaging is extremely dense; if a cell’s DNA became unwrapped and stretched out it would measure six feet! Biochemical changes of histone proteins either tighten or relax the wrapping of DNA. When a stretch of DNA is bound tightly around histones, genes located within that region do not turn on. DNA methylation, a change on the DNA strand, can also affect how genes are expressed. For each of the body’s cell types, epigenetic modifications manifest across the genome in a unique and dynamic pattern. We might think of this pattern as software that orchestrates the activity of thousands of genes. Why is epigenetics relevant to cancer? When changes take place in the proteins that control epigenetic processes, this can affect the expression of numerous genes that play a role in cancer initiation, development, or progression. Cancer-promoting genes that are normally silent may become activated while other genes that can suppress cancer are shut off. There are untold opportunities to develop drugs that restore normal gene expression in cancer cells. The field of cancer epigenetics really took off in the last couple of years, once we learned that one of the most commonly mutated processes in cancer is the one by which histones and DNA are chemically modified. The discovery caused enormous excitement among researchers because histone and DNA modifications can potentially be reversed with drugs. We know of about 70 different ways histones can be modified. By better understanding how the processes work, we might be able to tap into untold opportunities to develop drugs that restore normal gene expression in cancer cells. Your recent study suggests using a drug to inhibit DOT1 might be effective against many different types of AML. How does this drug work? In patients with a subtype called MLL-rearranged AML, immature blood cells fail to develop properly because a group of genes called HOX genes — which normally are shut off — become active, causing the cells to proliferate uncontrollably. DOT1, the target of the drug, is an enzyme that alters certain chemical groups on a histone protein. Earlier work in my lab has shown that the DOT1 inhibitor can be used to turn off HOX gene expression in MLL-rearranged AML cells. And by shutting off the HOX genes, we can thwart the cells’ cancerous behavior and make them grow up into mature, functional blood cells. Now, in our recent paper, we show that the drug could potentially help many more patients than we initially thought, which is very exciting. This is because a number of AML subtypes besides MLL-rearranged AML are driven by HOX gene expression. In his lab, Scott Armstrong leads research to develop more-effective drugs for leukemia. As a physician, he cares for children with the disease. Are there other potential implications of the study? Yes. We were able to clarify the inner workings of the epigenetic switch that turns on HOX genes in leukemia cells. We found that this switch can be manipulated by modifying a single carbon atom. This is pretty remarkable. Just imagine that the biological process that leads to a person’s leukemia might be heavily influenced by a tiny shift of one atom! We’re now working to use this information to understand more about the control of HOX gene expression and design more-effective drugs against cancers that depend on these genes. We are lucky to be collaborating with MSK structural biologist Dinshaw Patel and his lab members, who have made a number of groundbreaking discoveries in the field of epigenetics. This research was supported by the Leukemia & Lymphoma Society, Gabrielle’s Angel Foundation, and the National Institutes of Health under grant numbers CA105423, CA140575, and CA176745. Does it work for CML? Hi, thanks for your comment. We forwarded your question to Scott Armstrong. He says the Dot1L inhibitor has not been tested in patients with CML and for the moment the clinical trials are focused on leukemias with rearrangements of the MLL-gene. I remember a time, some fifty years ago, when the mention of cancer was frightful because little was known about its treatment. The word itself was not mentioned. We knew that 'CA' didn't mean California. Red Skelton's son was diagnosed with leukemia in the early 1960's; it was another example of the hopelessness associated with any known treatment for this fatal disease. My son was diagnosed and treated with a then-standard three-year protocol. Under the assiduous and compassionate care of Dr. Peter Steinherz, my son beat the odds of having a 50-50 chance to live to see kindergarten and is now happily married, employed, and recently became a step-grandfather. It is a marvel-in-progress to read of the research being conducted at MSKCC. Although I make a very modest montly contribution to MSKCC, I am very happy to know that every little bit helps, just as every little bit of researched discovery helps to overcome the life-threatening challenges, which cancer stubbornly presents. MSKCC is the worldwide premier medical center for the treatment of cancer, bar none. I remember telling Dr. Steinherz, when he said that he was going to a cancer conference in France during my son's treatment, "I am sure you are going to come back having learned a lot." In his characteristically humble way, he replied, "Mr. Kuhn, it is not what I will learn at the conference; it is what they will learn from me." He added that I should ask him any question that I might have about the most current treatment of acute lymphoblastic leukemia rather than refer to any oncology journal article, informing me that it takes two years for a study to be published and therefore to rely upon him for the most recent research findings. This conversation with Dr. Steinherz helped me tremendously to place my trust in him and in the research being conducted at MSKCC to shed my fear that my son would eventually die from leukemia as sadly as that happended to Red Skelton's son. Finally, it is with heart-felt gratitude that there are State-licensed clinical social workers on staff at MSKCC. They were tremendously helpful to parents such as myself, providing individual and group sessions of critically needed information to relieve feelings of fear, anxiety, frustration, and depression as well as help children cope emotionally with their hospitalization. The playroom was a psychosocial respite for both patient and parent; this recreational component had psychotherapeutic benefits, again, for both patient and parent. The nurses and hemotologists were as gentle,competent, and empathetic as humanly possible in relating to both patient and parent. God speed to all who work at MSKCC. Will the new drug work for CLL patients??? Thanks for reaching out, Jos. We forwarded your question to Dr. Scott Armstrong. He says the Dot1L inhibitor has not been tested in patients with CLL yet. The ongoing clinical trials are focused on leukemias with rearrangements of the MLL-gene. So happy to see the progress toward controlling and "curing" ALL!!! Sadly, my beloved daughter died almost 4 years ago, and we donated her body to MD Anderson for research...maybe some of it went toward this latest progress. Please God that a cure comes soon. Hi, Dr. Armstrong and Dr. Shukla, I hope that you fill find the right way to cure and eradicate this strong disease against which my son Gabriele had to face, and finally surrend. He was the second brave boy to receive Dot1L, at mskcc, under the attentive eyes of Dr. Shukla. I really hope that you will find the clue to block and cure MLL Leukemia. Patients with relapsed or Refractory ALL with t(9;11) have been eligible for the DOT1L inhibitor based on preclinical studies, but this study for adults is currently closed. The study for children is nearing completion but may still be open. MSKCC is one of the sites where these trials have been conducted. Dear Mary, we are sorry to hear about your mother’s diagnosis. To learn more about how this type of leukemia is treated - as well as investigational approaches being evaluated in clinical trials — please visit https://www.mskcc.org/cancer-care/types/leukemias/treatment. You may also be interested in looking into the various free podcasts, workshops, publications, and support groups for people with leukemia that CancerCare offers, available here: http://www.cancercare.org/diagnosis/leukemia. We hope this information is useful and wish your mother all our best as she moves forward with treatment. My nephew is 15 years old and has an AML. None of the treatment worked and his doctor said there is no option left for a treatment. Can you please review his medical record to see if DOT1 inhibitor might work for him? My family is desperately trying to find a new treatment option. Thank you. Dear Yun, we’re very sorry to hear about your nephew’s diagnosis. Memorial Sloan Kettering offers medical records reviews by mail only for international patients who are not able to come to the United States. If your nephew lives outside the US, you can go to https://www.mskcc.org/experience/become-patient/international-patients/… to learn more. If he is in the United States, he would need to come here for a consultation in order to get a second opinion. The number to call for an appointment is 800-525-2225 and you can go to https://www.mskcc.org/experience/become-patient/appointment for more information. Thank you for your comment, and best wishes to you and your family.